"The Subcontinent" redirects here. For other uses, see Continent § Subcontinents. The Indian subcontinent, is a southern region and peninsula of Asia, mostly situated on the Indian Plate and projecting southwards into the Indian Ocean from the Himalayas. Geologically, the Indian subcontinent is related to the land mass that rifted from Gondwana and merged with the Eurasian plate nearly 55 million years ago. Geographically, it is the peninsular region in south-central Asia delineated by the Himalayas in the north, the Hindu Kush in the west, and the Arakanese in the east. Politically, the Indian subcontinent includes Bangladesh, Bhutan, India, Maldives, Nepal, Pakistan and Sri Lanka. Sometimes, the geographical term 'Indian subcontinent' is used interchangeably with 'South Asia', although that last term is used typically as a political term and is also used to include Afghanistan. Which countries should be included in either of these remains the subject of debate. According to Oxford English Dictionary, the term "subcontinent" signifies a "subdivision of a continent which has a distinct geographical, political, or cultural identity" and also a "large land mass somewhat smaller than a continent". It is first attested in 1845 to refer to the North and South Americas, before they were regarded as separate continents. Its use to refer to the Indian subcontinent is seen from the early twentieth century. It was especially convenient for referring to the region comprising both British India and the princely states under British Paramountcy. The term Indian subcontinent also has a geological significance. Similar to various continents, it was a part of the supercontinent of Gondwana. A series of tectonic splits caused formation of various basins, each drifting in various directions. The geological region called "Greater India" once included Madagascar, Seychelles, Antarctica and Austrolasia along with the Indian subcontinent basin. As a geological term, Indian subcontinent has meant that region formed from the collision of the Indian basin with Eurasia nearly 55 million years ago, towards the end of Paleocene. The geographical region has historically simply been known as "India" (in antiquity referring to the Indus Valley region, not the entire subcontinent). Other related terms are Greater India and South Asia. And the terms "Indian subcontinent" and "South Asia" are sometimes used interchangeably. There is no globally accepted definition on which countries are a part of South Asia or the Indian subcontinent. The less common term "South Asian subcontinent" has seen occasional use since the 1970s. Geologically, the Indian subcontinent was first a part of so-called "Greater India", a region of Gondwana that drifted away from East Africa about 160 million years ago, around the Middle Jurassic period. The region experienced high volcanic activity and plate subdivisions, creating Madagascar, Seychelles, Antarctica, Austrolasia and the Indian subcontinent basin. 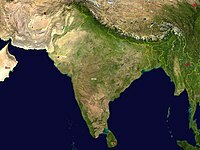 The Indian subcontinent drifted northeastwards, colliding with the Eurasian plate nearly 55 million years ago, towards the end of Paleocene. This geological region largely includes Bangladesh, Bhutan, India, Maldives, Nepal, Pakistan and Sri Lanka. The zone where the Eurasian and Indian subcontinent plates meet remains one of the geologically active areas, prone to major earthquakes. The English term "subcontinent" mainly continues to refer to the Indian subcontinent. Physiographically, it is a peninsular region in south-central Asia delineated by the Himalayas in the north, the Hindu Kush in the west, and the Arakanese in the east. It extends southward into the Indian Ocean with the Arabian Sea to the southwest and the Bay of Bengal to the southeast. Most of this region rests on the Indian Plate and is isolated from the rest of Asia by large mountain barriers. Using the more expansive definition – counting India, Pakistan, Bangladesh, Sri Lanka, Nepal, Bhutan and Maldives as the constituent countries – the Indian subcontinent covers about 4.4 million km2 (1.7 million sq mi), which is 10% of the Asian continent or 3.3% of the world's land surface area. Overall, it accounts for about 45% of Asia's population (or over 25% of the world's population) and is home to a vast array of peoples. NASA images of the Indian subcontinent during day and night. The Indian subcontinent is a natural physical landmass in South Asia, geologically the dry-land portion of the Indian Plate, which has been relatively isolated from the rest of Eurasia. Given the difficulty of passage through the Himalayas, the sociocultural, religious and political interaction of the Indian subcontinent has largely been through the valleys of Afghanistan in its northwest, the valleys of Manipur in its east, and by maritime routes. More difficult but historically important interaction has also occurred through passages pioneered by the Tibetans. These routes and interactions have led to the spread of Buddhism out of the Indian subcontinent into other parts of Asia. And the Islamic expansion arrived into the Indian subcontinent in two ways, through Afghanistan on land and to Indian coast through the maritime routes on the Arabian Sea. Whether called the Indian subcontinent or South Asia, the definition of the geographical extent of this region varies. Geopolitically, it had formed the whole territory of Greater India. In terms of modern geopolitical boundaries, the Indian subcontinent comprises the Republic of India, Pakistan, Bangladesh, Nepal, Bhutan, besides, by convention, the island nation of Sri Lanka and other islands of the Indian Ocean, such as the Maldives. The term "Indian continent" is first introduced in the early 20th century, when most of the territory was part of British India. The Hindu Kush, centered on eastern Afghanistan, is the boundary connecting the Indian subcontinent with Central Asia to the northwest, and the Persian Plateau to the west. The socio-religious history of Afghanistan are related to the Turkish-influenced Central Asia and northwestern parts of the Indian subcontinent, now known as Pakistan. Others state Afghanistan being a part of Central Asia is not an accepted practice, and it is "clearly not part of the Indian subcontinent". The precise definition of an "Indian subcontinent" as opposed to "South Asia" in a geopolitical context is somewhat contested. The list of countries by past and future population provides 1950, 2000 and 2050 population while the population for the year 2100 is taken from United Nations projections. ^ "World Population Prospects". United Nations: Population Division. 2017. ^ a b c d Robert Wynn Jones (2011). Applications of Palaeontology: Techniques and Case Studies. Cambridge University Press. pp. 267–271. ISBN 978-1-139-49920-0. ^ a b Baker, Kathleen M.; Chapman, Graham P. (11 March 2002), The Changing Geography of Asia, Routledge, pp. 10–, ISBN 978-1-134-93384-6, This greater India is well defined in terms of topography; it is the Indian sub-continent, hemmed in by the Himalayas on the north, the Hindu Khush in the west and the Arakanese in the east. ^ a b "Indian subcontinent". New Oxford Dictionary of English (ISBN 0-19-860441-6) New York: Oxford University Press, 2001; p. 929: "the part of Asia south of the Himalayas which forms a peninsula extending into the Indian Ocean, between the Arabian Sea and the Bay of Bengal. Historically forming the whole territory of Greater India, the region is now divided into three countries named Bangladesh, India and Pakistan." ^ a b Dhavendra Kumar (2012). Genomics and Health in the Developing World. Oxford University Press. p. 889. ISBN 978-0-19-537475-9. ^ a b Mariam Pirbhai (2009). Mythologies of Migration, Vocabularies of Indenture: Novels of the South Asian Diaspora in Africa, the Caribbean, and Asia-Pacific. University of Toronto Press. p. 14. ISBN 978-0-8020-9964-8. ^ As for example it is in the South Asian Games and the 8-nation South Asian Association for Regional Cooperation (SAARC), an economic cooperation organisation in the region, established in 1985, and ; SAARC Summit. "SAARC". SAARC Summit. Retrieved 17 December 2013. ^ a b c d Ewan W. Anderson; Liam D. Anderson (2013). An Atlas of Middle Eastern Affairs. Routledge. p. 5. ISBN 978-1-136-64862-5. , Quote: "To the east, Iran, as a Gulf state, offers a generally accepted limit to the Middle East. However, Afghanistan, also a Muslim state, is then left in isolation. It is not accepted as a part of Central Asia and it is clearly not part of the Indian subcontinent". ^ a b Michael Mann (2014). South Asia’s Modern History: Thematic Perspectives. Taylor & Francis. pp. 13–15. ISBN 978-1-317-62445-5. ^ a b c Jona Razzaque (2004). Public Interest Environmental Litigation in India, Pakistan, and Bangladesh. Kluwer Law International. pp. 3 with footnotes 1 and 2. ISBN 978-90-411-2214-8. ^ a b Hinsbergen, D. J. J. van; Lippert, P. C.; Dupont-Nivet, G.; McQuarrie, N.; Doubrovine; et al. (2012). "Greater India Basin hypothesis and a two-stage Cenozoic collision between India and Asia". Proceedings of the National Academy of Sciences. 109 (20): 7659–7664, for geologic Indian subcontinent see Figure 1. doi:10.1073/pnas.1117262109. PMC 3356651. ^ Official Records: Proces-verbaux Officiels. Supplement. Supplement 1624-1683, United Nations, 1972, p. 38. ^ Bethany D. Rinard Hinga (2015). Ring of Fire: An Encyclopedia of the Pacific Rim's Earthquakes, Tsunamis, and Volcanoes. ABC-CLIO. pp. 89–90. ISBN 978-1-61069-297-7. ^ Alexander E. Gates; David Ritchie (2006). Encyclopedia of Earthquakes and Volcanoes. Infobase. pp. 116–118. ISBN 978-0-8160-7270-5. ^ McLeod, John (1 January 2002). "The History of India". Greenwood Publishing Group – via Google Books. ^ Dhavendra Kumar (2012). Genomics and Health in the Developing World. Oxford University Press. pp. 889–890. ISBN 978-0-19-537475-9. ^ "Asia" > Geologic history – Tectonic framework. Encyclopædia Britannica. Encyclopædia Britannica Online, 2009: "The paleotectonic evolution of Asia terminated some 50 million years ago as a result of the collision of the Indian subcontinent with Eurasia. Asia’s subsequent neotectonic development has largely disrupted the continents pre-existing fabric. The neotectonic units of Asia are Stable Asia, the Arabian and Indian cratons, the Alpide plate boundary zone (along which the Arabian and Indian platforms have collided with the Eurasian continental plate), and the island arcs and marginal basins." ^ a b Desai, Praful B. 2002. Cancer control efforts in the Indian subcontinent. Japanese Journal of Clinical Oncology. 32 (Supplement 1): S13-S16. "The Indian subcontinent in South Asia occupies 2.4% of the world land mass and is home to 16.5% of the world population...."
^ "Indian Subcontinent" in Encyclopedia of Modern Asia. Macmillan Reference USA (Gale Group), 2006: "The area is divided between five major nation-states, Bangladesh, India, Nepal, Pakistan and Sri Lanka, and includes as well the two small nations of Bhutan and the Maldives Republic... The total area can be estimated at 4.4 million square kilometres, or exactly 10 percent of the land surface of Asia... In 2000, the total population was about 22 percent of the world's population and 34 percent of the population of Asia." ^ "Asia" > Overview. Encyclopædia Britannica. Encyclopædia Britannica Online, 2009: "The Indian subcontinent is home to a vast diversity of peoples, most of whom speak languages from the Indo-Aryan subgroup of the Indo-European family." ^ "Indian Subcontinent", in Encyclopedia of Modern Asia. Macmillan Reference USA (Gale Group), 2006: "The total area can be estimated at 4.4 million square kilometres, or exactly 10 percent of the land surface of Asia... In 2000, the total population was about 22 percent of the world's population and 34 percent of the population of Asia." ^ John L. Esposito; Emad El-Din Shahin (2016). The Oxford Handbook of Islam and Politics. Oxford University Press. pp. 453–456. ISBN 978-0-19-063193-2. Haggett, Peter (2001). Encyclopedia of World Geography (Vol. 1). Marshall Cavendish. p. 2710. ISBN 0-7614-7289-4. ^ "Indian subcontinent" is used by Henry D. Baker, British India With Notes On Ceylon Afghanistan And Tibet (1915), p. 401. ^ Ira M. Lapidus (2014). A History of Islamic Societies. Cambridge University Press. pp. 269, 698–699. ISBN 978-0-521-51430-9. Robert Wuthnow (2013). The Encyclopedia of Politics and Religion. Routledge. pp. 11–. ISBN 978-1-136-28493-9.